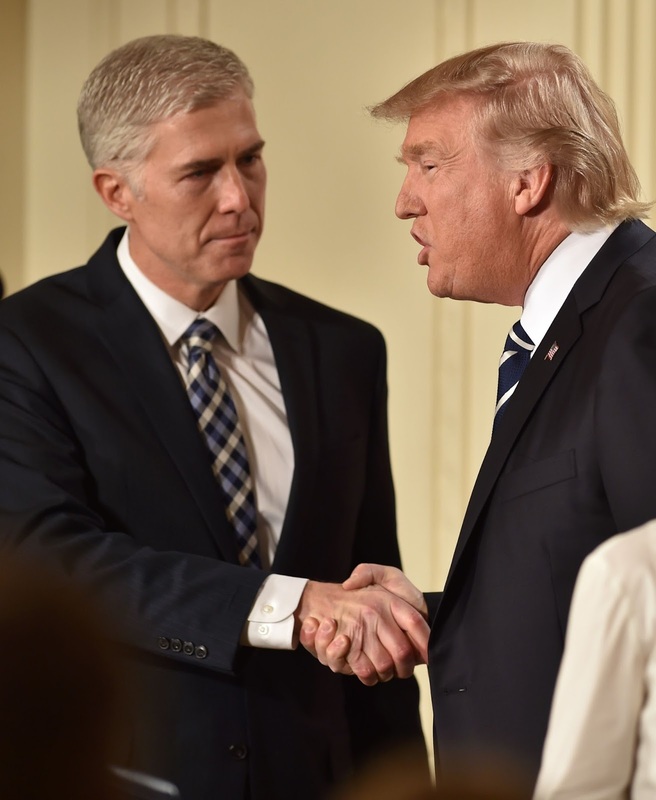 We've seen how the Scalia-esque approach to judicial decision-making avowed by now-Justice Gorsuch would have precluded cherished landmarks in American history. [See Part 2; Part 1.] His "focusing backward, not forward," insisting on what constitutional provisions specifically meant "at the time" they were drafted and ratified, is directly at odds with the vigorous enforcement of the overarching, fundamental principles at the heart of those provisions. We've discussed how that Gorsuch-Scalia approach to constitutional decision-making has been employed to fight, and then to condemn, virtually every advance in the fulfillment of equal protection, of due process, and of freedom from government intrusion into private matters. Indeed, virtually every cherished advance in the protection of our civil rights and liberties. The same is true for the rights of the accused. Those fundamental rights in our criminal justice system which we now take for granted. Most of those cherished criminal justice rights became protected because of landmark decisions that rejected traditional, "focusing-backward" practices that were based on what the Constitution was believed to permit "at the time." In those landmarks, the Gorsuch-Scalia jurisprudence--many will object to even calling it "jurisprudence"--was repeatedly rejected in the interests of much higher constitutional values. Of course, most of those who espouse that Gorsuch "backward-looking," "at the time" approach are actually far too embarrassed to denounce those landmarks today. But their ilk did exactly that when those landmarks were being considered and decided. And they condemned those advances in criminal justice--and some still do--using the same so-called "originalist-textualist" arguments embraced by Gorsuch and Scalia. The right to have an attorney when being criminally prosecuted, even if poor and can't afford one--the Supreme Court in Gideon v. Wainwright (1962) ruled that such a right to counsel is a constitutional guarantee because of the “noble ideal [of] fair trials," despite the absence of any specific mention in either the 6th Amendment (federal trials) or the 14th Amendment (state trials) about providing the poor with a lawyer, and despite precedent to the contrary. The right to be protected from unreasonable searches into our private lives--the Court in Katz v. U.S. (1967) held that constitutional search and seizure rights protected our legitimate privacy interests, not just those very few specific places and items that happen to be mentioned in the 4th Amendment; and the Court overruled "originalist-textualist" decisions to the contrary. The right to a jury trial in criminal cases--the Court in Duncan v. Louisiana (1968) ruled that to be a constitutionally guaranteed option for an accused as a necessary protection against sometimes overzealous prosecutors and callous judges; the Court overruled precedent and disregarded the absence of any specific words or meaning of words in the 14th Amendment (state trials) about guaranteeing jury trials. The rights against against compulsory self-incrimination and double jeopardy--in Malloy v. Hogan (1964) and Benton v. Maryland (1969), respectively, the Court overruled a line of precedents and ruled that those rights were constitutionally guaranteed because they were among the "principles of a free government" and "fundamental to the American scheme of justice," even though those rights were not identified and not specifically meant by the words of the 14th Amendment (state trials). The right to be informed of one's rights to silence and to an attorney before being interrogated--the Court in Miranda v. Arizona (1966) required the recitation of the now well known Miranda warnings to insure that persons being interrogated understood the constitutional rights they were being asked to waive; there is no mention of such warnings anywhere in the Constitution and such warnings were not intended by any words in the relevant 5th, 6th, or 14th Amendments. The prosecution must prove guilt beyond a reasonable doubt--the Court in In re Winship (1970) explicitly adopted the very protective reasonable doubt standard for criminal trials, even though not explicitly stated in the Constitution or explicitly meant by the words "due process" in the 5th (federal trials) or 14th (state trials) Amendments; the Court did so because of "a fundamental value determination of our society that it is far worse to convict an innocent man than to let a guilty man go free." The right to take the stand and testify on one's own behalf in a criminal prosecution--in Rock v. Arkansas (1987), the Court held that the Constitution guaranteed that right because "There is no justification today for a rule that denies an accused the opportunity to offer his own testimony [my emphasis]," notwithstanding the absence of any mention of such a right in the Constitution, and despite the historical, "at the time" refusal to permit accused persons to testify at their own trials. Each one of these criminal justice landmarks and countless others were possible because the Supreme Court avoided the Gorsuch approach. Instead of simply "focusing-backward" and applying what the words specifically meant "at the time" they were enacted, the Court gave life to the broader principles of justice, equity, and decency that underlie the constitutional provisions dealing with the rights of the accused. In fact, the "focusing-backward," "at the time," so-called "originalist-textualist" arguments were used to oppose those landmarks and are still used today to denounce, disparage, dilute, or try to undo some of them. Should we go back, before these landmarks, before the right to counsel was enforced in Gideon? Or privacy in Katz? Or protections against double jeopardy and against compulsory self-incrimination as in Malloy and Benton? Etc., etc. And what about advances in the future? Improvements and greater fulfillment of fundamental constitutional principles? Do we really want to forego that? Well, that going back and foregoing advances is precisely the meaning and heritage of the Gorsuch-Scalia "focusing-backward," "at the time," so-called "originalist-textualist" approach to constitutional decision-making. Next in this series, we'll look at some of the actual decisions and opinions authored by now-Justice Gorsuch while he was an appeals court judge.